KK Superyachts reports that it has taken on the central agency of the 43.2m motor yacht Northern Cross. 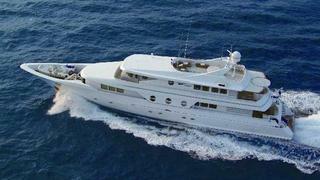 Built by Marinteknik in 1991, she’s a high-volume superyacht with a successful charter record and a good turn of speed. Accommodation is for 10 guests in a master suite plus two double and two single staterooms, while twin 1,750hp Caterpillar engines give her a cruising speed of 18 knots. Lying in Sweden, Northern Cross is asking €4,900,000.